-Ultra-light conditioning formula instantly hydrates and protects, yet hair retains natural body and bounce. -Eliminates tangles and instantly provides control over hard-to-manage hair. 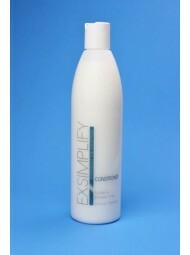 -Apply to clean damp hair after shampooing with Exsimplify Shampoo. -Pour a quarter sized amount of conditioner into palm of hand and emulsify. -Squeeze excess moisture from hair. -On clean damp hair, apply liberally to hair and scalp. -Gently comb through to distribute evenly and until hair is tangle-free. -Rinse with a cool water to enhance detangling and conditioning benefits. -Follow with the appropriate Exsimplify styling products.